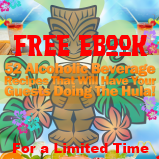 Everyone loves Hawaii, and now you can have a taste of Hawaii wherever you live. Of course, we all know that Aloha means “Hello”, but do you know how to say “Thank You”, “Let’s Surf”, or “See You Soon” in Hawaiian? Well, now you can! You can surf the Hawaiian Language, learn cool surfing lingo from our Surf Dictionary, and even learn how to say Your Hawaiian Name. 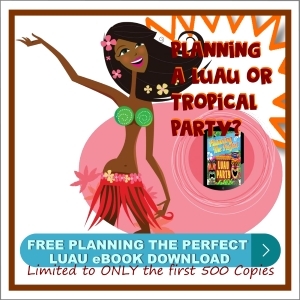 Or, maybe you want to have the coolest luau/party in town. Try some of these awesome Hawaiian Recipes. And if you have any of your own favorites, just let us know. We’d love to expand this section of the site. If you really want to see what Hawaii’s all about, check out some of the cool Surfing Videos – those guys and gals are just amazing! Chill...were on Hawaiian time. 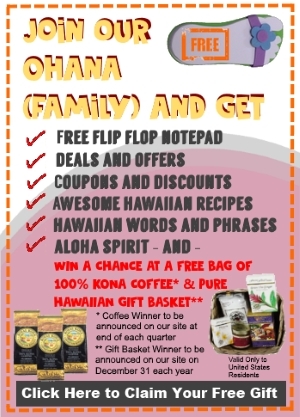 Catch a wave, hang loose, and Surf Our Store for everything Hawaiian – gourmet coffees, including 100% kona, Hawaiian teas, fresh baked cookies and Hawaiian treats, and customized gift baskets.